Barbie dolls and accessories from 1958 to 1973 were auctioned in Chicago and are featured in a sale report in Kovels On Antiques & Collectibles February 2019 newsletter. Mattel’s Barbie turns 60 this year and the dolls, costumes and related toys are still popular. Among the items pictured in Kovels’ — a Barbie No. 1 doll with a brunette ponytail and original box and accessories that auctioned for $4,600, an early Ken doll with blond flocked hair in the original box that brought $173, as well as a Barbie “Dream House” and sportscar. Furniture by T.H. Robsjohn-Gibbings, a 1950s design “influencer,” was included in a recent Florida auction. His pieces have the wide lines and angular forms that were common in midcentury furnishings. Kovels’ February newsletter pictures Robsjohn-Gibbings seating and tables, even a lamp, along with their prices. 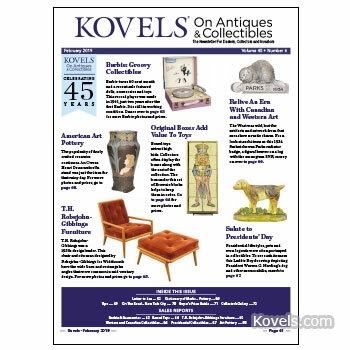 And Kovels’ latest issue contains art pottery, old and newer, that sold in Cincinnati. Find priced examples of Alhambra and Mosaic Tile Co. tiles, an Owens Pottery umbrella stand and a Rookwood paperweight along with some vases by contemporary potters. Collectors love antique and vintage toys — especially toys with their original boxes. Prices at a New Jersey auction confirmed the added value that original packaging brings. Kovels’ February newsletter pictures a number of the toys with boxes that featured colorful graphics and helpful manufacturer information. And a California auction that specializes in Western art offered collectibles from Canada and the West. Their rustic charm is evident in the pieces pictured in Kovels’ latest issue, from an antique moose call and Native American snowshoes to a Calgary Stampede pennant and a Saskatchewan Parks beaver badge. The Kovels celebrate Presidents’ Day with memorabilia from a New Jersey auction that reminds us of the lives and legends of some former presidents. They go “on the road” to New York City to explore the annual Salon Art + Design fair. Kovels’ popular illustrated Collector’s Gallery answers readers’ questions about an Alice in Wonderland cookie jar, an antique coverlet, a Homenick violin and a set of Wedgwood dishes. February’s Dictionary of Marks lists American pottery marks with dates. And more than 70 antiques and collectibles are listed in February’s Buyer’s Price Guide.